A menthol cigarette is a cigarette flavored with the compound menthol. Menthol cigarettes are not healthier than other cigarettes, although they are more addictive than other types of cigarettes. Young people who use menthol cigarettes are 80% more likely to become life-long smokers than those who use regular cigarettes. Menthol cigarettes were first developed by Lloyd "Spud" Hughes of Mingo Junction, Ohio in 1924, though the idea did not become popular until the Axton-Fisher Tobacco Company acquired the patent in 1927, marketing them nationwide as "Spud Menthol Cooled Cigarettes". Spud brand menthol cigarettes went on to become the fifth most popular brand in the U.S. by 1932, and it remained the only menthol cigarette on the market until the Brown & Williamson Tobacco Company created the Kool brand in 1933. The Camel menthol cigarette was suggested and designed by Charles George as an independent designer. RJR initially rejected the idea stating that Salem was their one and only Menthol cigarette and would not change. The Camel menthol cigarette was introduced two years later in 1990 or thereabouts. RJR fails to confirm or acknowledge the acceptance of the idea and has ignored the inventor's request for acknowledgement and payment. For over two decades, Kools were the only significant menthol cigarette brand in the United States, with a market share that never got much above 2%. Their advertisements focused on "throat comfort" and the "medicinal" properties of menthol, and some ads even suggested occasional use: "In between the others, rest your throat with Kools." R. J. Reynolds Tobacco Company launched the first menthol filter-tip cigarettes in 1956 under the Salem brand. Less heavily mentholated than Kools, Salems were positioned as an all-purpose cigarette, and captured 0.8% market share within their first year. Other tobacco producers, seeing the success of Salem, soon introduced their own mentholated filter cigarettes: Lorillard with Newport in 1957 and Spring in 1959; Philip Morris with Alpine in 1959; and Brown & Williamson with Belair in 1960. Marlboro Ice Blast, in addition to being a normal mentholated cigarette, also contains a menthol capsule inside the filter that can be cracked open by the smoker at the desired moment. Menthol cigarettes are constructed similarly to non-mentholated cigarettes, with menthol added at any of several stages during the manufacturing process. Menthol may be derived from distilled corn mint oil, or produced synthetically. While trace amounts of menthol may be added to non-mentholated cigarettes for flavor or other reasons, a menthol cigarette typically has at least 0.3% menthol content by weight. Lower-tar menthol cigarettes may have menthol levels up to 2%, in order to keep menthol delivery constant despite the filtration and ventilation designs used to reduce tar. A recent innovation has been to include a small capsule in or near the filter which can be crushed to release additional menthol or other flavoring solutions. During the smoking of a cigarette the menthol delivery depletes noticeably, but this technology allows the smoker to increase the menthol delivery at a chosen point to sustain or enhance the menthol 'feel'. The capsules can contain any flavorings but are primarily menthol. Menthol cigarette usage varies widely by country. They are most popular in the Philippines, where they account for over 60% of total cigarette sales. In the United States, menthols comprise about 30% of the total cigarette market. Menthol cigarettes are purchased disproportionately by African-American smokers, with 80% of African-American smokers consuming menthol cigarettes primarily. The proportion of smokers who use menthols rose from 31% in 2004 to 33.7% in 2010, according to a 2010 study by the Substance Abuse and Mental Health Services Administration. Much of the increase comes from young people. Racial marketing strategies changed during the Fifties. The civil rights movement led to the rise of African-American publications, such as Ebony. This helped tobacco companies to target separate marketing messages by race. :57 Tobacco companies supported civil rights organizations, and advertised their support heavily. Industry motives were, according to their public statements, to support civil rights causes; according to an independent review of internal tobacco industry documents, they were "to increase African American tobacco use, to use African Americans as a frontline force to defend industry policy positions, and to defuse tobacco control efforts". There had been internal resistance to tobacco sponsorship, and some organizations are now rejecting nicotine funding as a matter of policy. Race-specific advertising exacerbated small (a few percent) racial differences in menthol cigarette preferences into large (tens of percent) ones. It has been proposed that menthol cigarettes, which are more addictive but not healthier, should be banned, partially on grounds that race-specific marketing for a more addictive product is a social injustice. Despite it being illegal at the time, tobacco marketers gave out free menthol cigarette samples to children in black neighborhoods in the U.S. Similar practices continue in Subsaharan Africa, where a 2016 study found over 12% of South African students had been given free cigarettes by tobacco company representatives. In addition to high use by African Americans, menthol cigarettes are used disproportionately by adolescents, women, and lesbian, gay, bisexual, and transgender (LGBT) Americans. LGBT Americans are twice as likely as straight ones to use menthol cigarettes, according to CDC research. Where these demographics overlap, menthol use is especially high: most female LGBT smokers use menthols, as do 80 percent of African American youth smokers and 70 percent of LGBT youth smokers. Tobacco companies have targeted the LGBT community with advertising for menthol cigarettes, most notably through Project SCUM. A Federal Trade Commission report released September 21, 2012, said menthol cigarettes had gone from 27 percent in 2008 to 22 percent in 2010. There is evidence that banning menthol cigarettes helps menthol smokers to quit. Given that menthol is preferentially used by young smokers, it is expected that bans may reduce smoking initiation. In March 2012, Brazil became the first country to outlaw flavored cigarettes, including menthol cigarettes. On 21 June 2013, EU health ministers agreed on a directive to ban menthol cigarettes; this decision might be implemented within three-and-a-half years. In response, the former German chancellor Helmut Schmidt,(1918-2015), was reported to have hoarded 200 cartons of his preferred menthol cigarette brand in his house. On October 8, 2013 the European Parliament agreed by voting to ban menthol and other flavored cigarettes as of 2022. Although the use of menthol in ointments and cough drops is regulated by the Food and Drug Administration (FDA) in the United States of America, regulation of cigarettes was removed from their purview in 2000 by the Supreme Court in a 5–4 ruling, FDA v. Brown & Williamson Tobacco Corp. In October 2009, the United States Congress passed the Family Smoking Prevention and Tobacco Control Act, which gave the FDA the authority to regulate tobacco products and ban flavor additives, although the act contained an exception for menthol. On March 18, 2011, the Tobacco Products Scientific Advisory Committee (an advisory panel to the FDA) concluded that removing menthol cigarettes from the market would benefit public health in the United States, but stopped short of recommending that the Food and Drug Administration take any specific actions, like restricting or banning the additive. In response, the tobacco industry released a report to the FDA changed focus subject by claiming menthol cigarettes are no riskier than regular cigarettes and should not be regulated differently. A progress report on panel findings was expected from the FDA in July 2011. In November 2018 the U.S. Food and Drug Administration announced its intention to outlaw menthol cigarettes, later changing this position to advocate for restriction of flavored tobacco and e-cigarettes to a separate age-restricted room. The FDA stated that this change in position was due to their belief that they do not have the legal regulatory authority to unilaterally declare a ban, citing concerns that any such ban would result in litigation that the FDA would lose. Several black advocacy groups have voiced opposition to a proposed ban on menthol in cigarettes. The Congress of Racial Equality, the National Black Chamber of Commerce, the National Organization of Black Law Enforcement Executives, and the National Black Police Association have urged the FDA to reject a ban on mentholated cigarettes due to concerns that banning mentholated cigarettes could spur an illicit market for the outlawed products in minority communities. The doctors' group African American Tobacco Control Leadership Council supports the ban. Groups representing law enforcement officers also oppose the ban. The Law Enforcement Alliance of America and the National Troopers Coalition have urged the FDA to consider the impact a ban on menthol cigarettes would have on tobacco smuggling. The proposed menthol ban also saw opposition from organized labor. In December 2010, workers from the Bakery, Confectionery, Tobacco Workers and Grain Millers' International Union protested outside a meeting between FDA officials and industry representatives in Raleigh, North Carolina, arguing that a menthol ban would cost many workers their jobs. Additionally, the National Association of Convenience Stores opposes the ban based on menthol cigarettes accounting for 4% of their sales. The risk of lung cancer is no different for menthol cigarettes compared to regular cigarettes. Menthol increases nicotine receptor density in the brain, making menthol cigarettes more addictive than unflavored ones. Menthol cigarettes have been shown to inhibit nicotine metabolisation, leading to increased systemic nicotine exposure and increased nicotine addiction. ^ a b c Tobacco Products Scientific Advisory Committee (TPSAC) of the Center for Tobacco Products of the Food and Drug Administration (FDA) (2011-07-21). Menthol Cigarettes and Public Health: Review of the Scientific Evidence and Recommendations (PDF). US Food and Drug Administration. p. 252. Retrieved 2018-05-24. ^ a b c Kabbani, Nadine (2013-07-23). "Not so Cool? Menthol's discovered actions on the nicotinic receptor and its implications for nicotine addiction". Frontiers in Pharmacology. 4: 95. doi:10.3389/fphar.2013.00095. ISSN 1663-9812. PMC 3720998. PMID 23898298. ^ "Process of Treating Cigarette Tobacco". 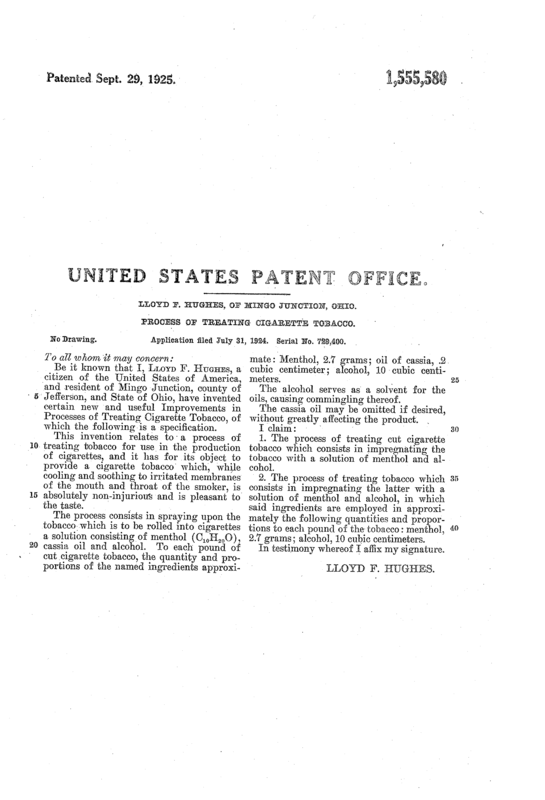 United States Patent Office. ^ a b McNichols, Tom (25 March 2011). "Mint that Kills: The Curious Life of Menthol Cigarettes". The Atlantic. Retrieved 18 July 2011. ^ a b Market Science Associates. "The Growth of Menthols: 1933–1977". ^ a b c "Characterization of Menthol: History and Design of Menthol Cigarettes" (PDF). Retrieved 11 April 2013. ^ "Menthol Capsules in Cigarette Filters - Increasing the Attractiveness of a Harmful Product" (PDF). Tobacco Prevention and Tobacco Control. German Cancer Research Center, Heidelberg. 2012. ^ Giovino, G.A. ; Sidney, S; Gfroerer, J.C.; O'Malley, P.M.; Allen, J.A. ; Richter, P.A. ; Cummings, KM (February 2004). "Epidemiology of Menthol Cigarette Use". Nicotine and Tobacco Research. 6 Suppl 1: S67–81. doi:10.1080/14622203710001649696. PMID 14982710. ^ "Lorillard, Inc 2012 Form 10-K, p. 40". U.S. Securities and Exchange Commission. Retrieved 8 April 2013. ^ Gardiner, Phillip S. (February 2004). "The African Americanization of menthol cigarette use in the United States". Nicotine & Tobacco Research. 6 Suppl 1: –55–65. doi:10.1080/14622200310001649478. ISSN 1462-2203. PMID 14982709. ^ Rubin, Rita (2009-09-27). "Exclusion of menthol cigarettes in ban worries health experts". USA Today. Retrieved 2010-05-12. ^ "Harvard Researchers Gather More Evidence Implicating Menthol in Health Disparities Between White and Black Smokers". Harvard School of Public Health. August 18, 2005. ^ "National Survey on Drug Use and Health". Substance Abuse and Mental Health Services Administration. November 18, 2011. ^ Davis, Ronald M.; Gilpin, Elizabeth A.; Loken, Barbara; Viswanath, K.; Wakefield, Melanie A. (2008). The role of the media in promoting and reducing tobacco use (PDF). National Cancer Institute tobacco control monograph series. U.S. Department of Health and Human Services, National Institutes of Health, National Cancer Institute. p. 684. ^ Yerger, V. B.; Malone, R. E. (2002-12-01). "African American leadership groups: smoking with the enemy". Tobacco Control. 11 (4): 336–345. doi:10.1136/tc.11.4.336. PMC 1747674. PMID 12432159. Retrieved 2018-05-24. ^ Edwards, Jim (January 5, 2011). "Why Big Tobacco Targeted Blacks With Ads for Menthol Cigarettes". Retrieved 2018-05-24. ^ a b Tavernise, Sabrina (2016-09-13). "Black Health Experts Renew Fight Against Menthol Cigarettes". The New York Times. Retrieved 2018-05-24. ^ "Cigarette Suit Says Maker Gave Samples To Children". The New York Times. Associated Press. 2004-06-27. Retrieved 2018-05-24. ^ "Evans v. Lorillard: A Bittersweet Victory Against the Tobacco Industry" (PDF). Tobacco Control Legal Consortium. Mitchell Hamline School of Law. August 2016. Retrieved 20 December 2018. ^ Chandora, Rachna; Song, Yang; Chaussard, Martine; Palipudi, Krishna Mohan; Lee, Kyung Ah; Ramanandraibe, Nivo; Asma, Samira; GYTS collaborative group (October 2016). "Youth access to cigarettes in six sub-Saharan African countries". Preventive Medicine. 91S: –23–S27. doi:10.1016/j.ypmed.2016.01.018. PMID 26845374. ^ Rose, Shyanika W; Jo, Catherine L; Binns, Steven; Buenger, Melissa; Emery, Sherry; Ribisl, Kurt M (2017-02-27). "Perceptions of Menthol Cigarettes Among Twitter Users: Content and Sentiment Analysis". Journal of Medical Internet Research. 19 (2): e56. doi:10.2196/jmir.5694. ISSN 1439-4456. PMC 5348619. PMID 28242592. ^ Fallin, Amanda; Goodin, Amie J.; King, Brian A. (January 2015). "Menthol Cigarette Smoking among Lesbian, Gay, Bisexual, and Transgender Adults". American Journal of Preventive Medicine. 48 (1): 93–97. doi:10.1016/j.amepre.2014.07.044. ISSN 0749-3797. PMC 4454462. PMID 25245795. ^ a b Moodie-Mills, Aisha (May 12, 2011). "Flavored Disease and Death for Minorities". Center for American Progress. Retrieved 4 October 2018. ^ Craver, Richard (2012-09-25). "Reynolds to offer more menthol versions of Pall Mall cigarettes". Winston-Salem Journal. ^ "A menthol cigarette ban may influence smokers to quit". Reuters. 2018-03-08. Retrieved 2018-05-26. ^ Chaiton, Michael; Schwartz, Robert; Cohen, Joanna E.; Soule, Eric; Eissenberg, Thomas (2018-05-01). "Association of Ontario's Ban on Menthol Cigarettes With Smoking Behavior 1 Month After Implementation". JAMA Internal Medicine. 178 (5): 710–711. doi:10.1001/jamainternmed.2017.8650. PMC 5876835. PMID 29507934. Retrieved 2018-05-26. ^ "Brazil bans flavored tobacco". WHO Framework Convention on Tobacco Control. ^ "EU agrees ban on menthol cigarettes". RTÉ. 21 June 2013. ^ "Ex-Chancellor 'hoards 38,000 cigarettes'". The Local. 9 July 2013. ^ "EU bans menthol, targets e-cigarettes". Jakarta Post. October 9, 2013. ^ "FDA V. Brown & Williamson Tobacco Corp. (98-1152)". United States Supreme Court. ^ a b Wilson, Duff (18 March 2011). "Advisory Panel Urges F.D.A to Re-examine Menthol in Cigarettes". The New York Times. ^ "Tobacco Makers Fight Menthol Rules". Associated Press. 18 March 2011. Archived from the original on 27 April 2012. ^ Kaplan, Sheila; Hoffman, Jan (2018-11-16). "F.D.A. Seeks Restrictions on Teens' Access to Flavored E-Cigarettes and a Ban on Menthol Cigarettes". The New York Times. ISSN 0362-4331. Retrieved 2018-12-20. ^ "Much heated puffing among minority groups over menthol cigarette ban". Los Angeles Times. 18 October 2010. ^ Rubin, Rita (14 March 2011). "FDA weighs ban on Newports, other menthol cigarettes". USA Today. ^ Lee, Jessie (24 March 2011). "Banning menthol cigarettes will create contraband market". Indianapolis Recorder. ^ Kenney, Tanasia (2016-09-19). "Why These Black Doctors Are Pushing President Obama to Ban Menthol Cigarettes, Tobacco Products". Atlanta Black Star. Retrieved 2018-05-24. ^ "National Troopers Coalition Applauds FDA Consideration of New Black Market Tobacco Study". PR Newswire. 18 November 2010. ^ "NC Union Says FDA Menthol Ban Would Hurt Workers". Associated Press. 8 December 2010. ^ Zajac, Andrew (18 March 2011). "Tobacco industry brushes off call for FDA restrictions on menthol cigarettes". Los Angeles Times. ^ Lee, PN (April 2011). "Systematic review of the epidemiological evidence comparing lung cancer risk in smokers of menthol and regular cigarettes". BMC Pulmonary Medicine. 11 (18): 18. doi:10.1186/1471-2466-11-18. PMC 3103484. PMID 21501470. ^ Benowitz, Neal; Herrera, Brenda; Jacob, Peyton (2004). "Mentholated Cigarette Smoking Inhibits Nicotine Metabolism". Journal of Pharmacology and Experimental Therapeutics. 310 (3): 1208–15. doi:10.1124/jpet.104.066902. PMID 15084646. This page was last edited on 29 March 2019, at 20:55 (UTC).